I’ve written before about my trips to Cochon Butcher (here in 2012 and again in 2014). On Friday, I had friends in town who had never had a muffaletta. For those who aren’t familiar, visualize a cousin of the Italian sub. Layers of various meats and cheese—ham, capicola, salami, mortadella, provolone are typical–plus some sort of pickled veggies. In the case of muffaletta, it is typically an olive salad. 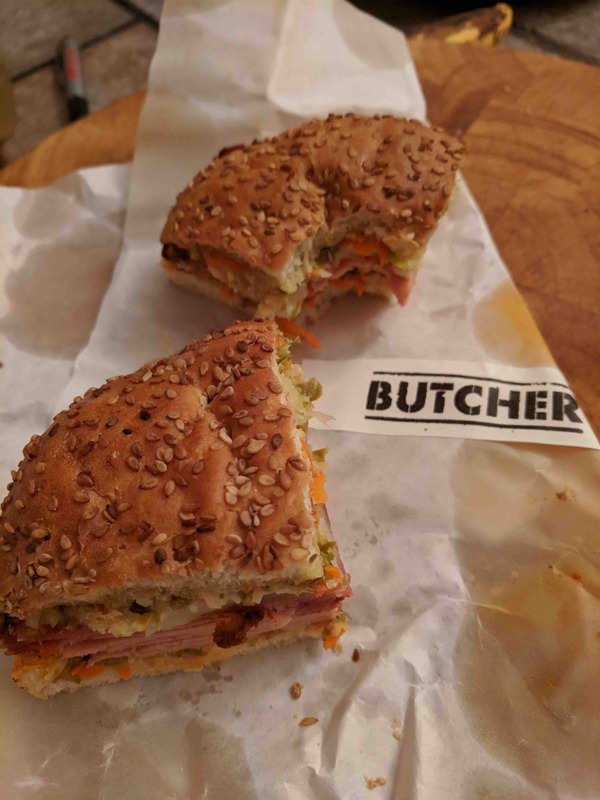 The Cochon Butcher version has smoked meats on a sesame seed Sicilian bun. They were a really nice flavor addition. The olive salad wasn’t overpowering, it gave just the right amount of tang to the sandwich. We also had the Brussel sprouts, mac and cheese and pretzels but we inhaled all of those too fast for me to get picture. Trust me, they were all delicious. I’ve yet to have anything that wasn’t good at this place. 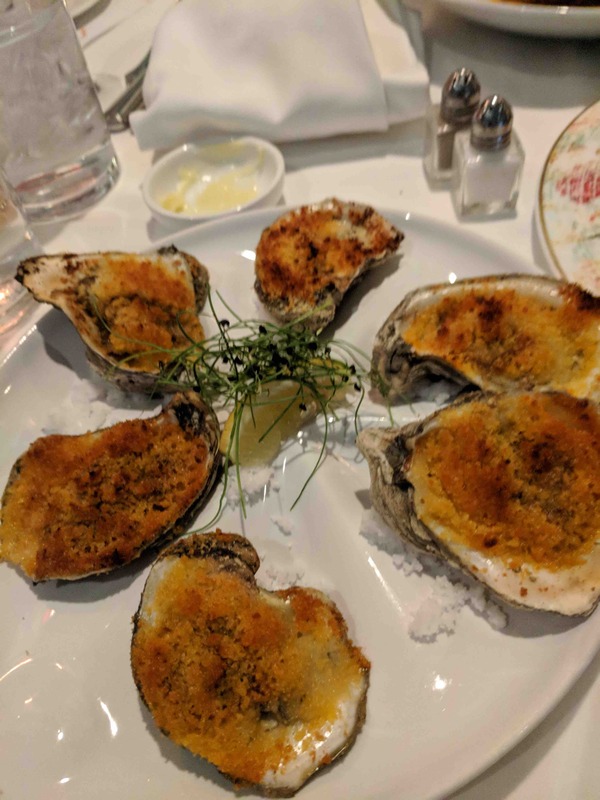 My friends, Leigh and Garrett, brought their family through New Orleans on their way to a vacation and we went to Brennan’s Restaurant for dinner. If you’re looking for a lovely dinning experience with lots of old New Orleans’ charm, this is a place to go. We started with cocktails. 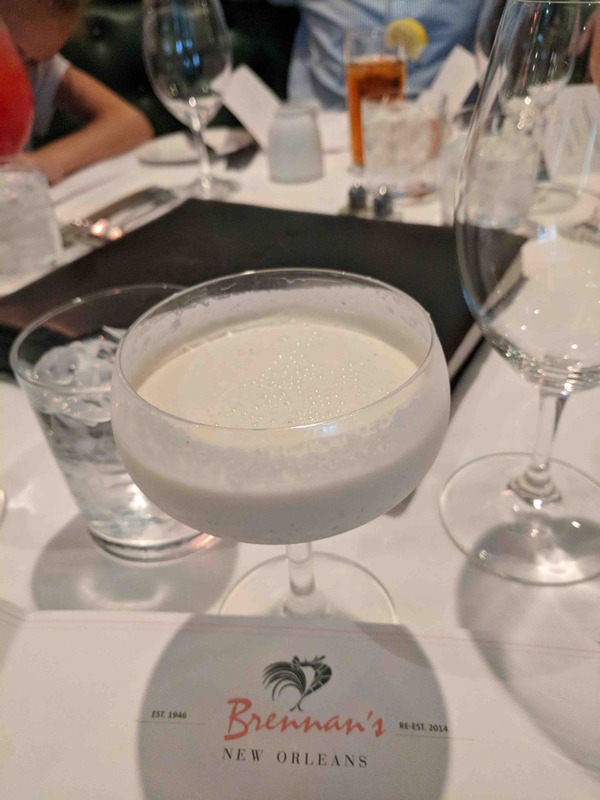 Garrett and I had the Caribbean milk punch with bourbon and rum and cream and vanilla. It was like drinking a glass of melted vanilla ice cream – if only ice cream had a sneaky little kick to it. Their son, Jake, had the good taste to order a number of terrific appetizers. 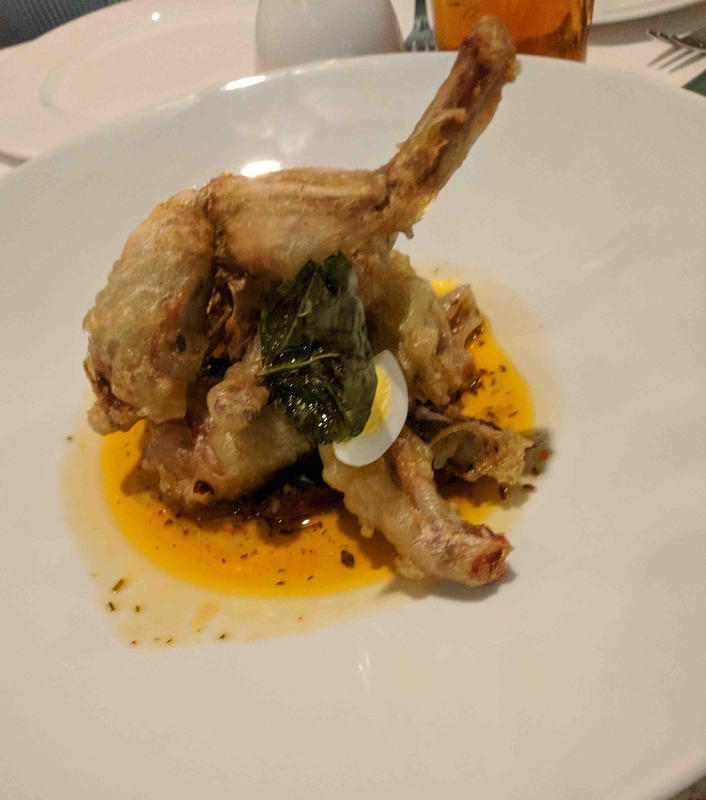 The frog legs were light and crispy with the tempura batter. 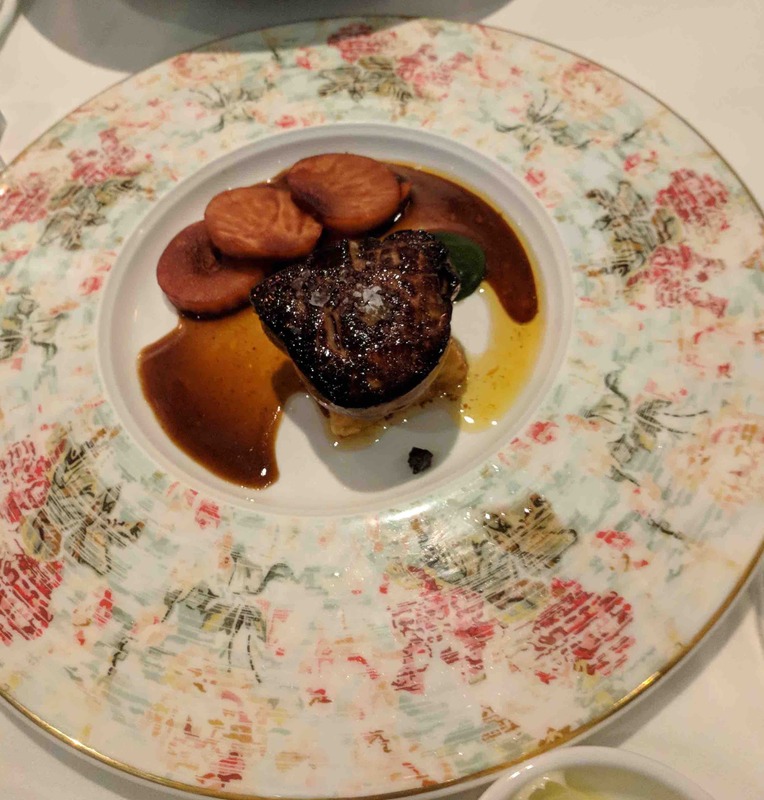 The foie gras was smooth and buttery. 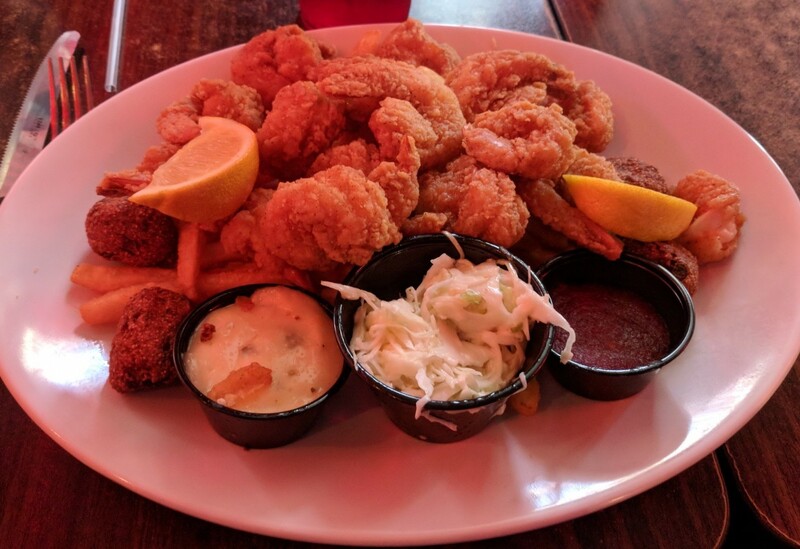 The roasted oysters that the others ate were large. 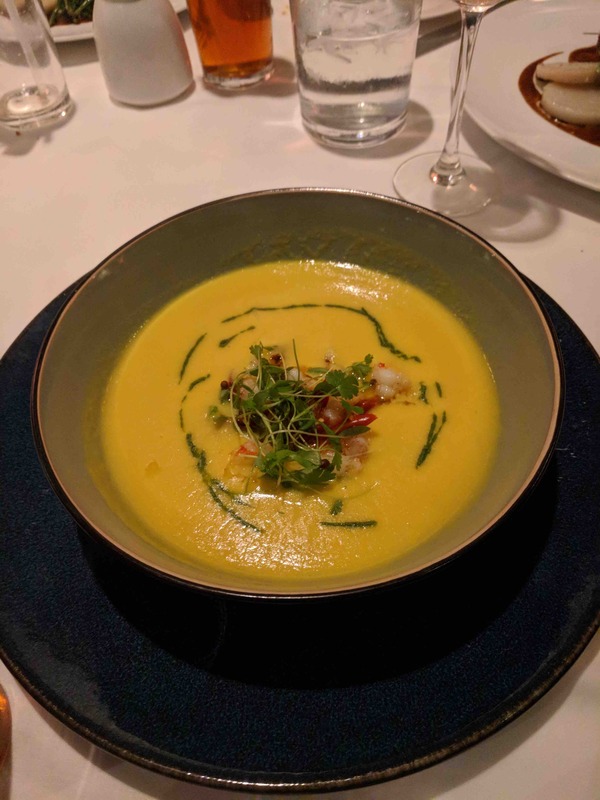 Michelle had the the summer corn and coconut soup with shrimp. Very good flavor. 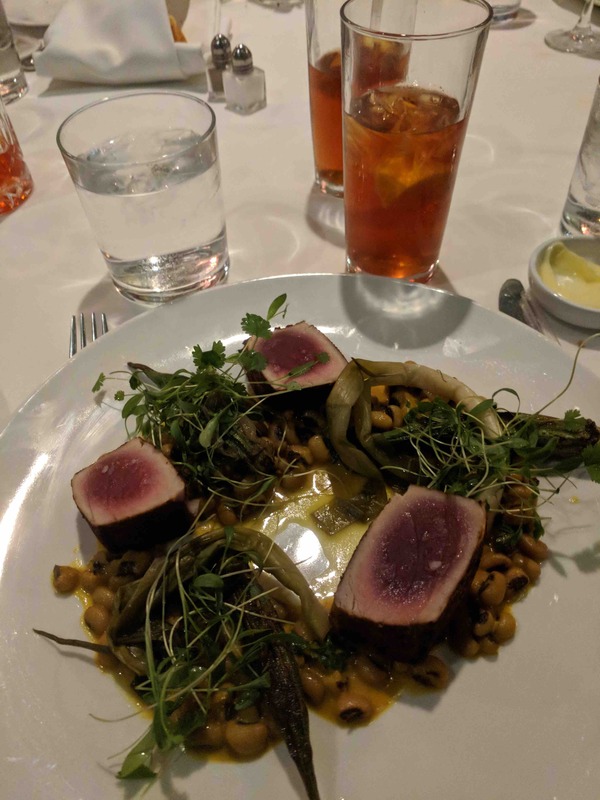 I ordered the spiced tuna, rare. While the outside had a lot of heat, the creamy black eyed peas took away the burn. 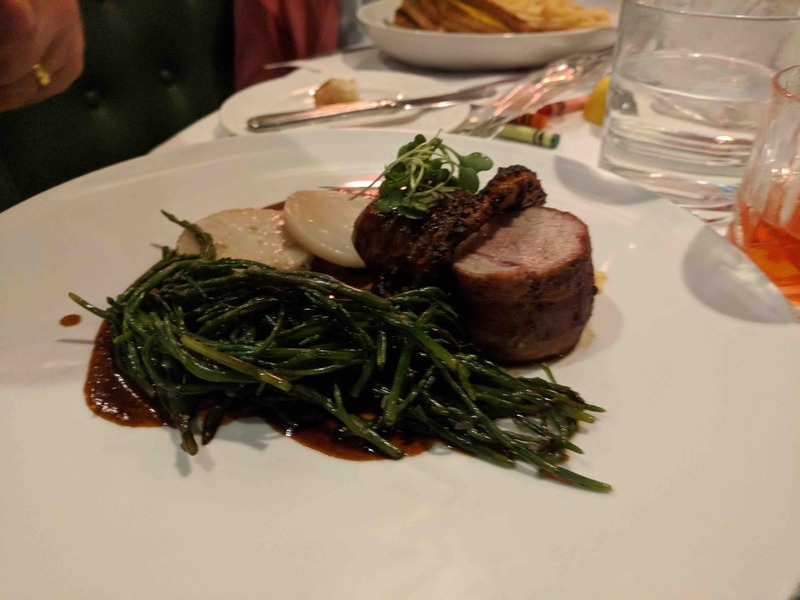 I tried the bacon wrapped pork tenderloin with octopus that the rest of the table ordered. Very smokey and delicious. For dessert we had bananas foster, of course. I took a lovely video of the table side, flambe presentation but it didn’t turn out so I’m afraid you’re missing out both on the experience and flavor. The walls are covered with paints of old carnival floats and the secret patio is lovely to look at from the air conditioned dining room. The wait staff was attentive and knowledgeable. The general manager even stopped by the table to make sure all was well. I would definitely recommend Brennan’s for your next high level, culinary affair. For my birthday dinner, my folks came into town and we went to Charlie’s Steakhouse. 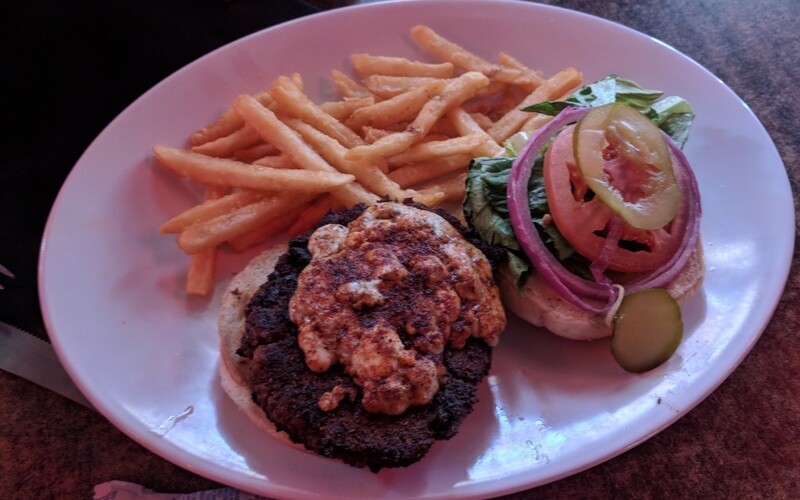 Located on Dryades in Uptown, it is only open for dinner, Tuesday through Saturday. This is an old school steakhouse with no menus because there not much else on the menu but steak and sides. 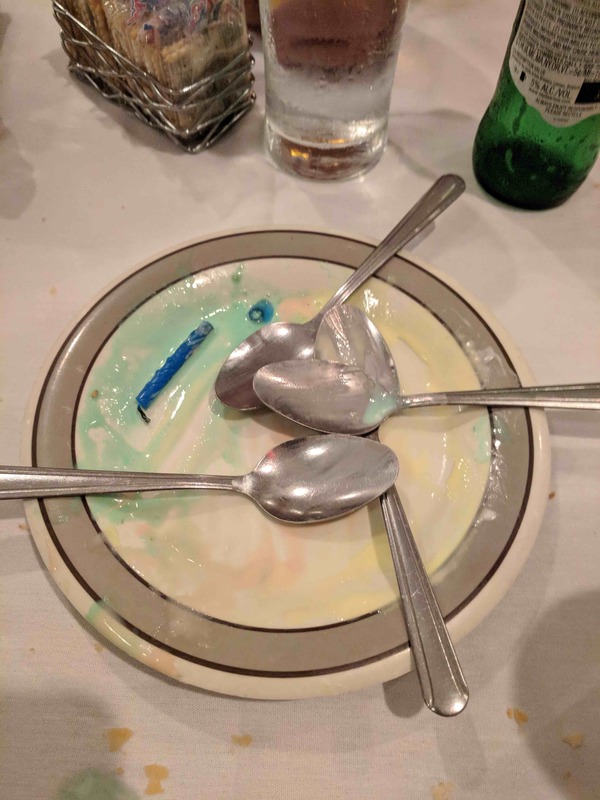 Exactly what I was looking for in a birthday dinner. 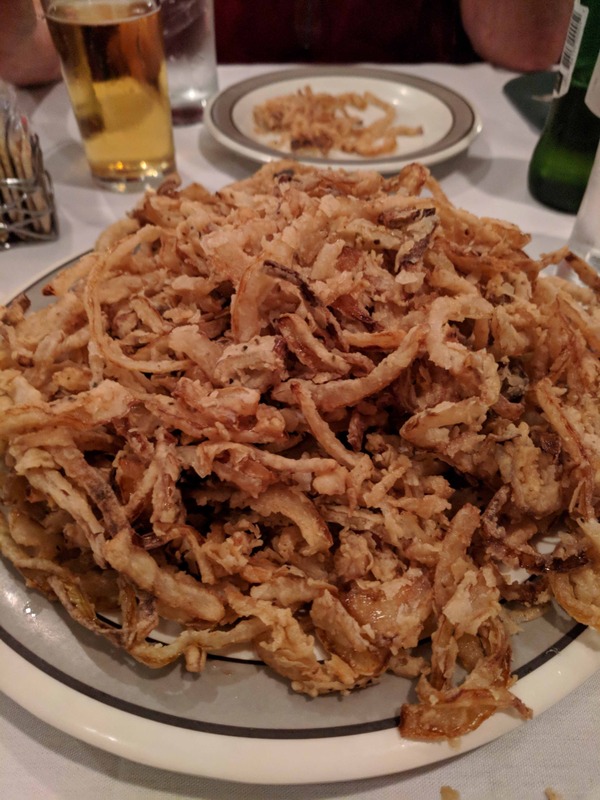 We started with onion rings. Thinly cut and deep fried, they were quite delicious. We all ate more than we should have based on how big the steaks were going to be. 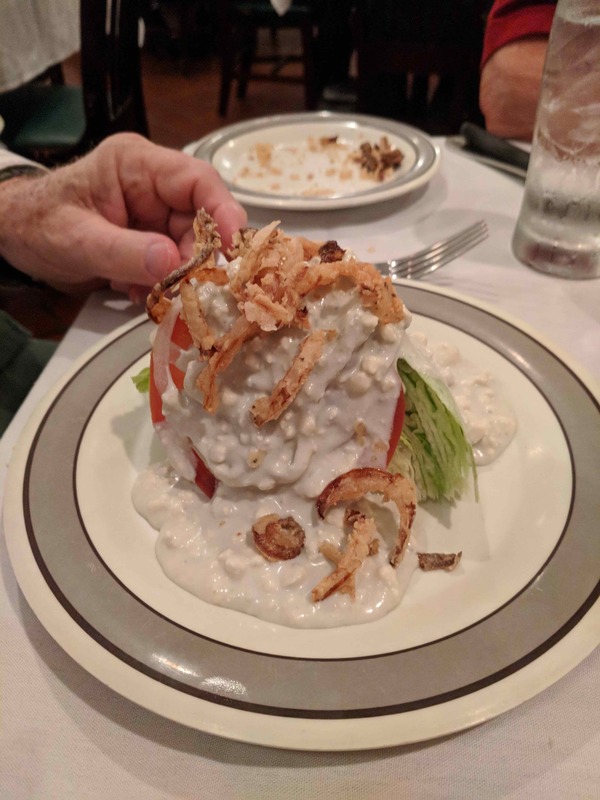 Dad had half a wedge salad with bleu cheese dressing. He used some of the left over onion rings as a crouton. We all went for 14 ounce ribeyes. Simply prepared with just salt and pepper, they came to the table still sizzling. All were cooked perfectly to order (from blue to rare to medium rare to medium) and were very succulent. The sides were choose potatoes au gratin and sauteed button mushrooms. The potatoes were a little over salted but quite good with hunks of potato and lots and lots of cheddar cheese. They paired well with the lightly salted steak. 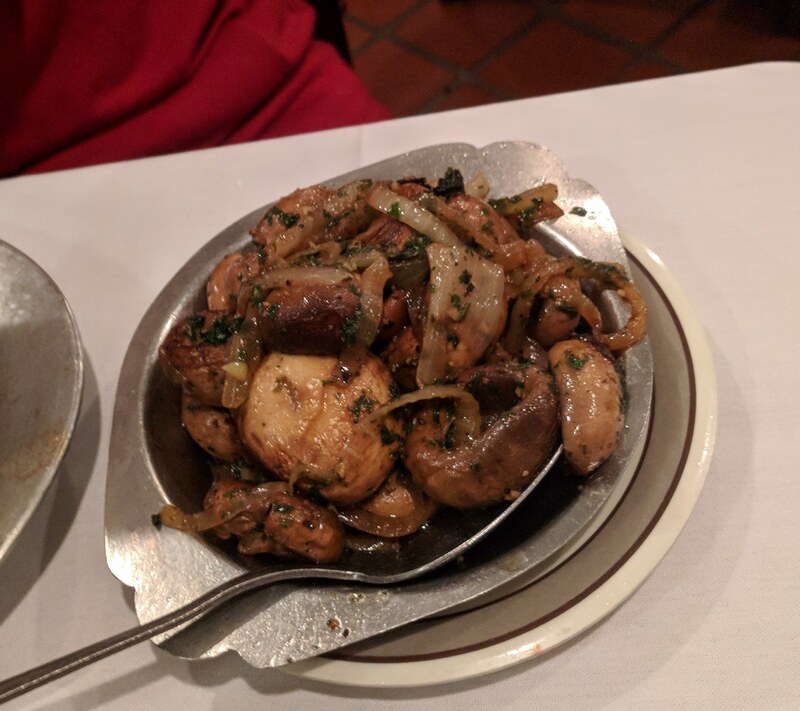 The mushrooms and onions went very well with the steaks with their buttery flavor. 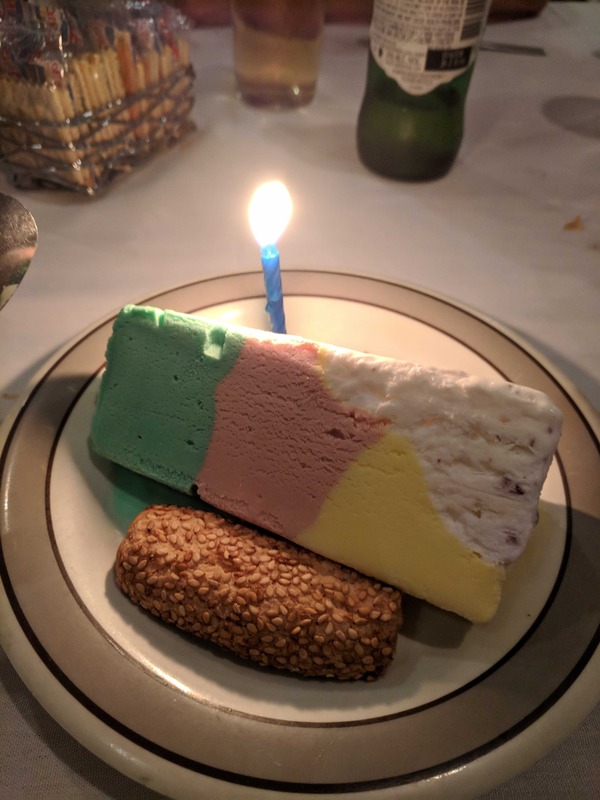 As it was my birthday, they brought out spumoni, a very rich ice cream. And, yes, I did share. We finished every last bite of dessert (although, we each had some steak left over for sandwiches the next day – and the day after that). The atmosphere is relaxed and casual. The server was polite and very attentive. Everyone we came in contact with was friendly and personable. We even got a history lesson from the manager/owner about the original family, the restaurants they opened and were related to– so basically a success story of immigration to America. Oh, and a couple fun ones about bootlegging during Prohibition. 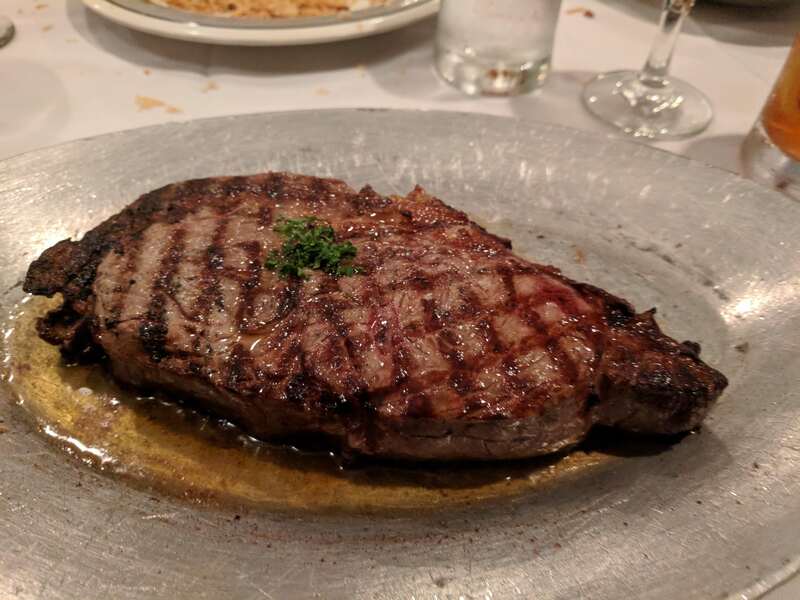 I would definitely recommend Charlie’s steaks. I know I’m not going to wait for another major milestone to go back again. 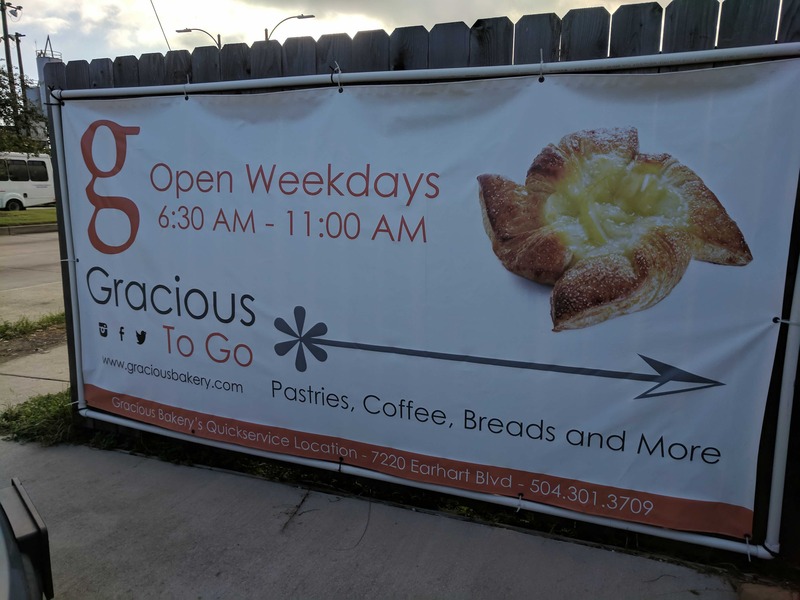 If you’re looking for good desserts (as well as other bakery items), Gracious bakery is the place to go. In fact, if I’m out and about in the morning around Earhart Blvd, I try to stop in a Gracious to Go. They are only open until 11am during the week here but, you are in and out fast, with fresh goodies to go. Today, Michelle and I picket up a selection. We loved the deep, rich flavor of Valrhona chocolate in the chocolate croissant and chocolate pecan hand pie. 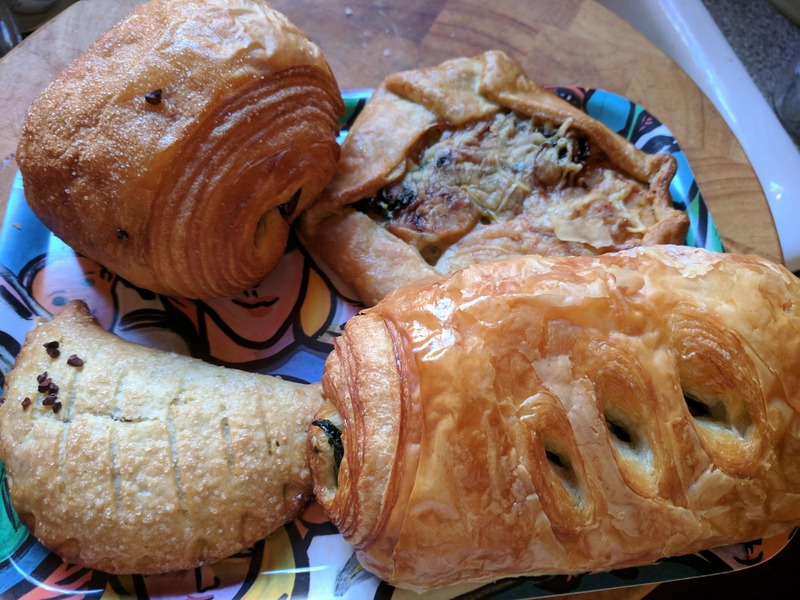 The croissant was large, flakey and buttery and the hand pie almost had a cookie crust to go with the decadent interior. We also some savory items, including a seasonal tart with sweet potato, Brussel sprouts and gruyere cheese and a spinach and goat cheese croissant. The folks are super friendly and ready to make recommendations as well as encourage indulgences. Prices are reasonable and everything is fresh and creatively made. Try their two other locations for sandwiches and other items (one in Mid-city on Jeff Davis Pkwy and the other in the Garden District on St. Charles Avenue). After Turbine No. 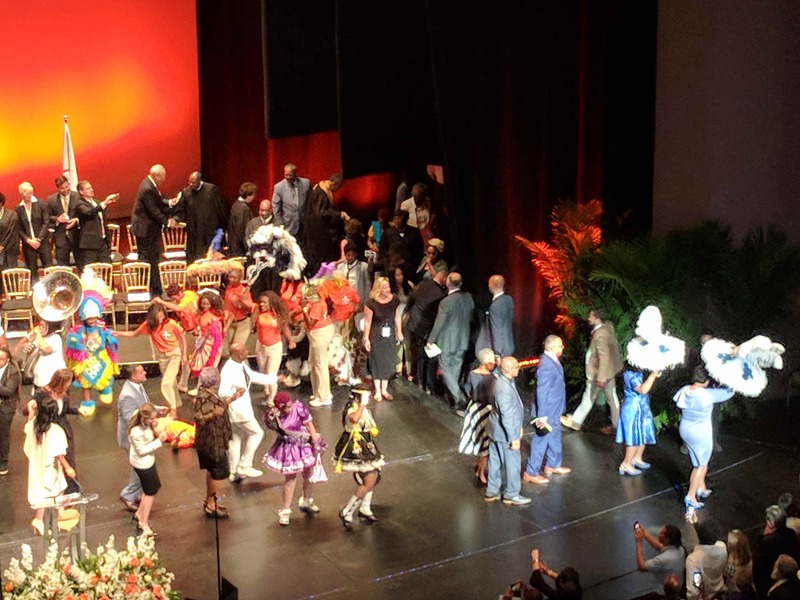 6 went offline on Wednesday, September 20 at 7:25am, the New Orleans Sewerage and Water Board took twenty minutes to switch over to an alternative electrical supply. Because the power loss resulted in a drop of water pressure to 15 psi, a boil water advisory was issued an hour later that continues today. 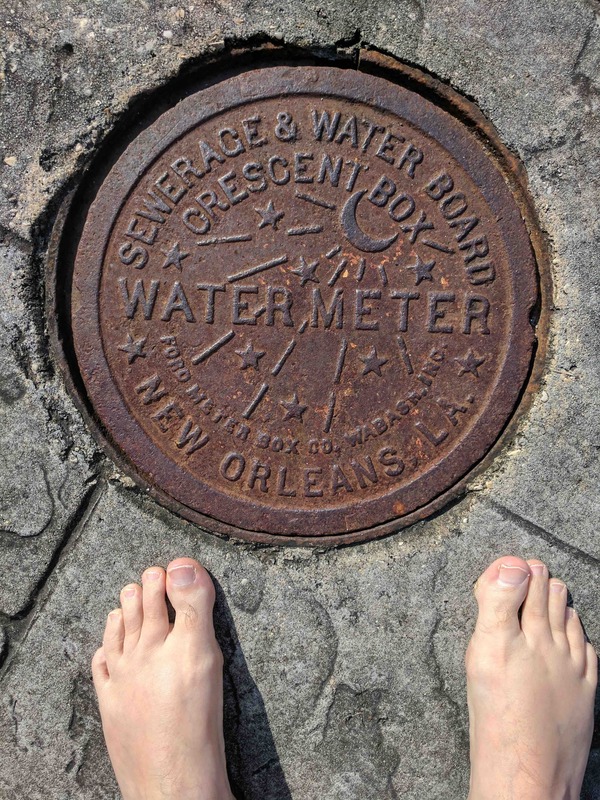 New Orleans has an aging and cracked infrastructure and without sufficient pressure from inside the pipes, contaminants could leach into the pipes from the substrate. Marsha Broussard, the City of New Orleans Director of Health, said no one should drink the tap water for the foreseeable future. Bottled or boiled water should be used to drink, cook, brush teeth, wash fruits and vegetables and to make ice. Pets should also be given bottled or boiled water. Heat water until large bubbles come from the bottom to the top of the pot. Turn off the heat and let the water cool. Store the water in a clean container with a cover. If you don’t like the taste of boiled water, pour cooled water back and forth from one clean glass into another to add air to the water. 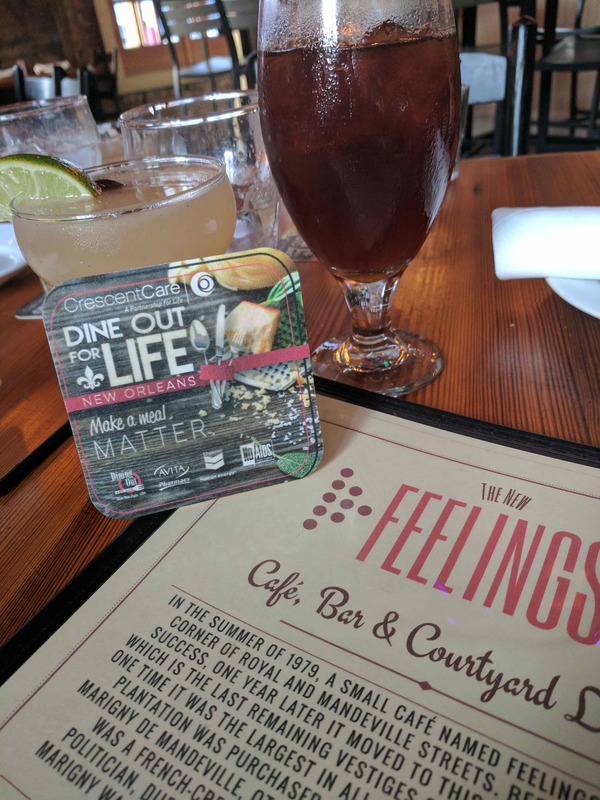 Every year, AIDS service organizations join with restaurants for Dining Out for Life. The restaurants donate a portion of the day’s proceeds so diners get a great meal and the organizations get financial support. Crescent Care (formerly NO/AIDS Task Force) is my local beneficiary and I whole heartedly support their mission, so I make an effort to take in as many meals as I can for the event. 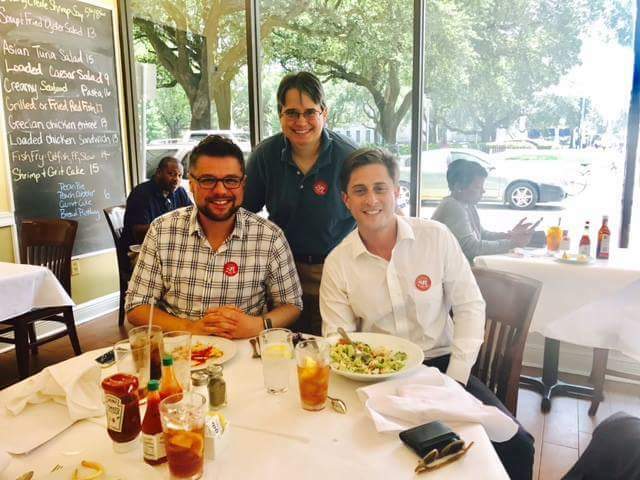 For lunch, I went to Cafe at the Square (reviewed here in 2010) with my friend Ryan and we interviewed Seth Bloom, a candidate for New Orleans City Council for possible endorsement by the Forum for Equality. I had the Fried Green Tomato BLT and the sandwich was just as good as I remembered – thick bacon slices, tangy green tomatoes and spicy arugula on a ciabatta bun. 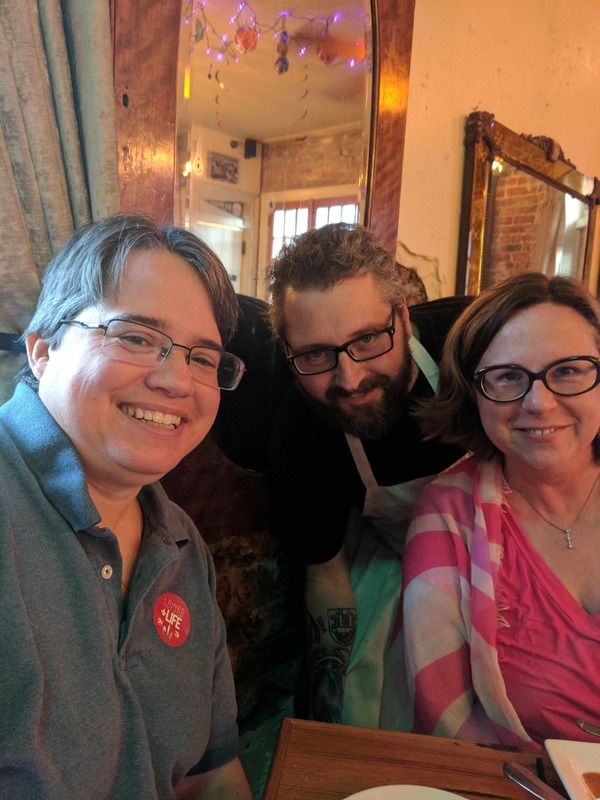 For dinner, I went with my friends Charlotte and Thomas to the New Feelings Cafe and Bar (previously reviewed here in 2011) in the Marigny. 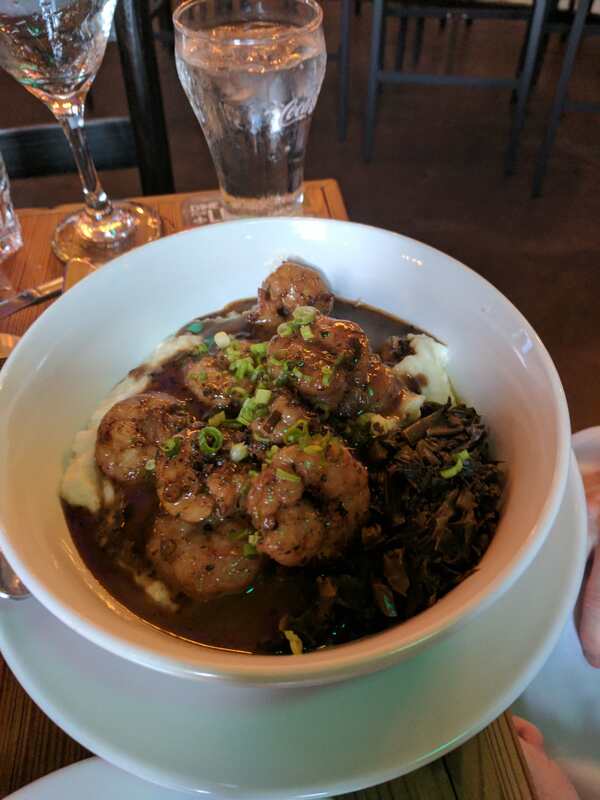 We had been excited to learn that Chef Scott Maki had recently won Chopped and wanted to see how the menu and space had changed since we had last been there. The space is light and airy, with lots of quirky and nostalgic artwork on the walls. The menu had a lot of the things that made them such a great place before plus a number of new items. They still have the beautiful courtyard but, we opted for air conditioning, so we ate inside. We started with cocktails. Charlotte went for the one with mezcal and enjoyed it enough to order a second. I really liked the coconut rum in my Hemingway. 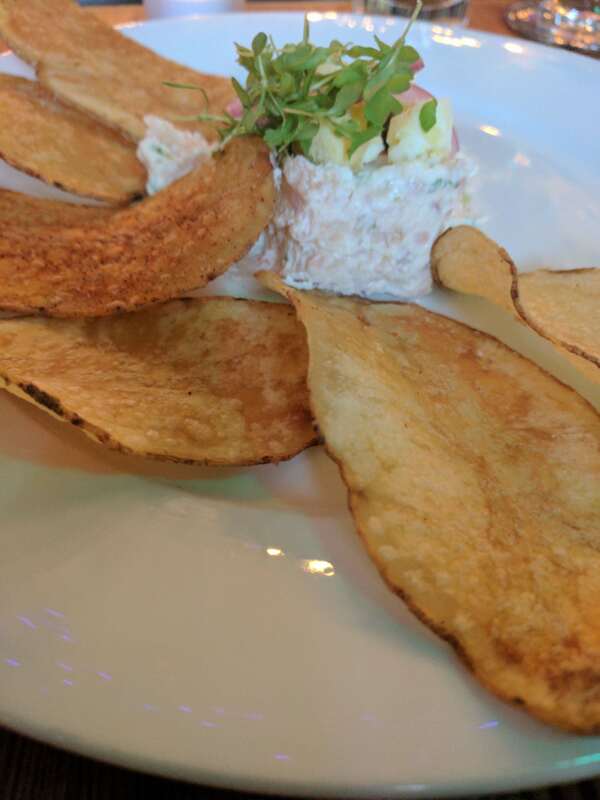 For appetizers, we had the mushroom sopapilla with black beans and avocado – nice combo of flavors and also the smoked trout dip (pictured) with house made kettle chips. Very tasty, especially with a couple shakes of hot sauce. I had the fried chicken sandwich. Piled high with chicken, crisp dill pickle slices, lettuce and tomato and their special sauce, it was an explosion of flavor. 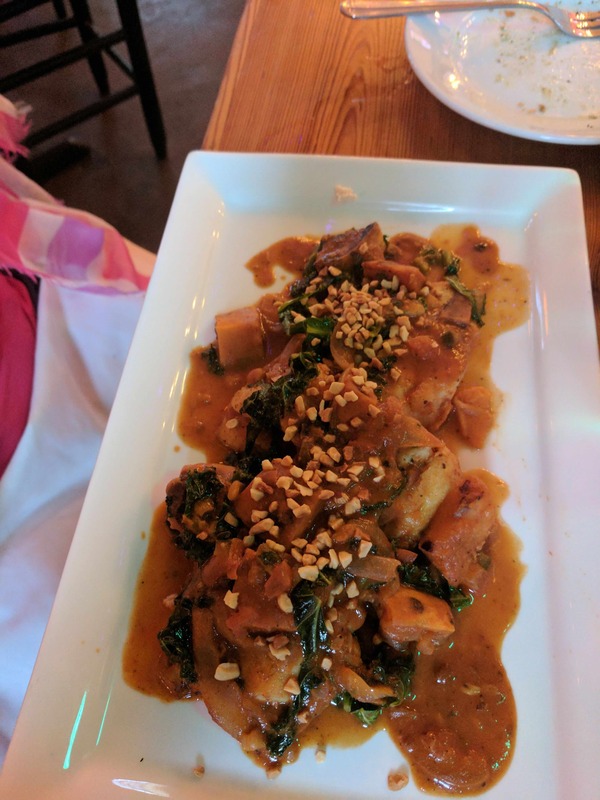 Charlotte went for the curry spiced fish with yams and a lovely peanut sauce. She thought it was very tasty, even the kale. 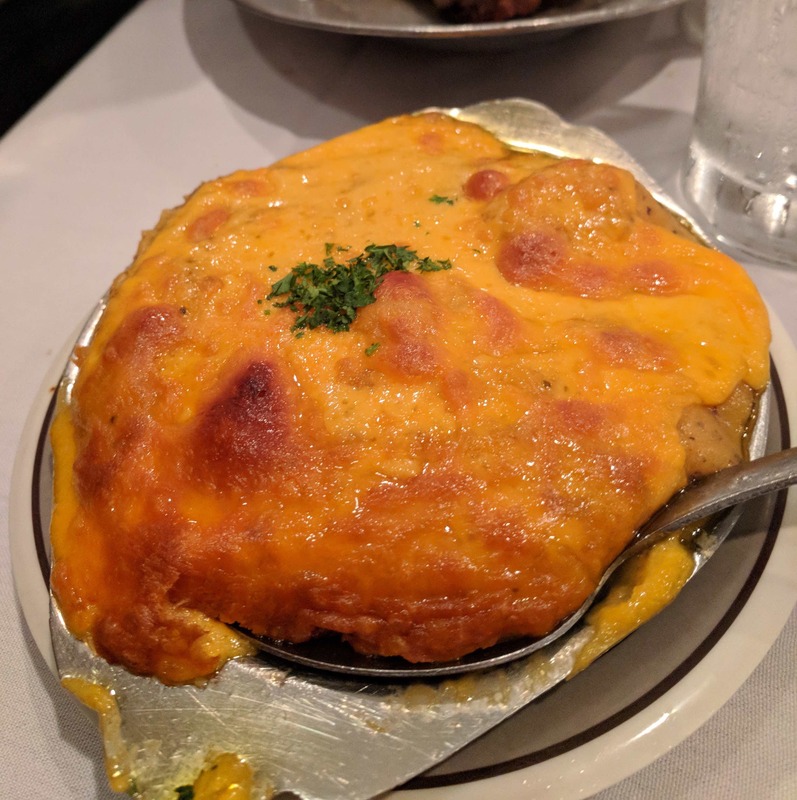 Thomas had Shrimp and Grits – the grits were made extra decadent with gouda cheese. 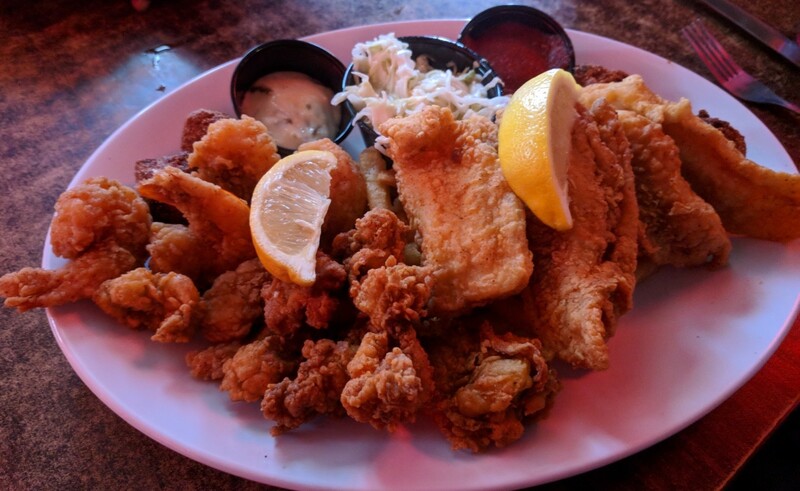 It was so gooda, I wanted to steal another bite but Thomas was keeping a close eye on me. The BBQ shrimp were also very good with a deep, rich sauce. Dessert was the Vietnamese coffee flan and chocolate hand pie. 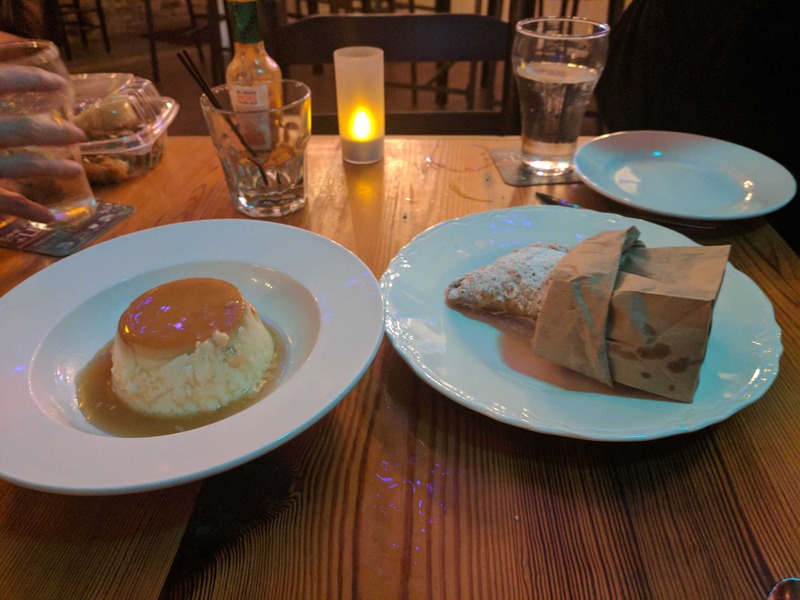 Delicate flavor on the flan and the pie was reminiscent of the Hubig pies. Served hot, it was very delicious. Attentive and friendly waitstaff. Creative chef. Romantic courtyard. 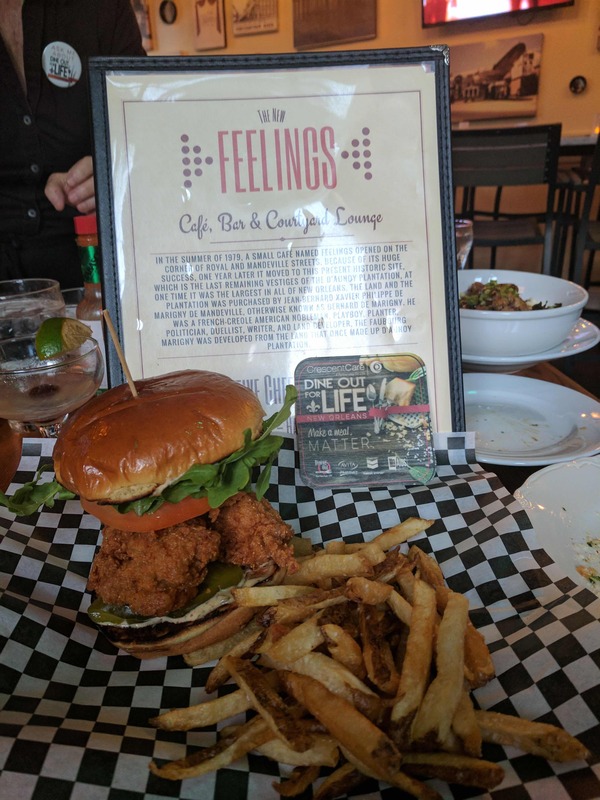 Lots of feels for the New Feelings Cafe. Worth going to, even without the excuse of your dollars doing good.